An amazing chrome camouflage type pattern with fine smooth multi-directional textured facets, which can handle hard playing without scratching. Splashes of light reflects from the gleaming polished surface. Polished 100% non-magnetic stainless steel, corrosion free. Fits - Screw holes will fit most genuine Fender USA & MiM Strats. 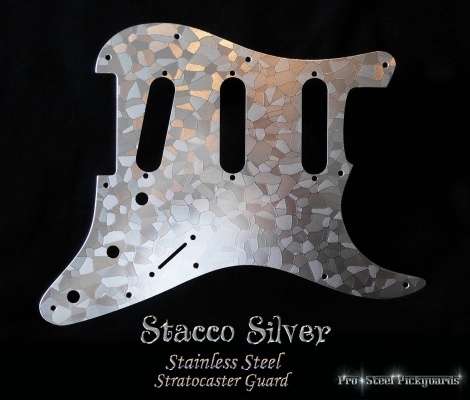 Any Strat that a current Fender Strat guard fits. Fender Strat guard, see Downloads and print the template to check fit.